On the day she became Britain’s longest-reigning monarch, the Queen officially opened the new Borders Railway. In front of a huge crowd of cheering and flag-waving Borderers and visitors from around the world, and accompanied by her husband, the Duke of Edinburgh, and Scotland’s First Minister Nicola Sturgeon, she unveiled a plaque at the new Tweedbank Station to declare the 30.5-mile rail link open. The royal party had travelled from Edinburgh’s Waverley Station, accompanied by 150 invited guests, including Borders councillors and VIPs. Young and old, as well as the world’s media had descended on Tweedbank from early in the morning to await the arrival of the royal train pulled by the iconic steam locomotive, Union of South Africa. Bands, including Galashiels Ex-Service Pipe Band, entertained the crowds while they waited, and the event was compered by Alasdair Hutton, the voice of the Edinburgh Military Tattoo. Alighting from the train after it arrived at Tweedbank slightly later than expected due to a delay, the Queen was greeted by dignitaries headed by Lord Lieutenant The Hon Gerald Maitland-Carew. After being introduced to the waiting line-up of guests, the Queen and Duke of Edinburgh, accompanied by Ms Sturgeon, took their places in front of the curtained plaque. Speaking first, Ms Sturgeon acknowledged the milestone which made it a historic day for many people far beyond the Borders, with the Queen becoming the longest-serving monarch in Scottish and UK history. Ms Sturgeon said throughout her reign, the monarch had carried out her duties with dedication, wisdom and an exemplary sense of public service. “And all of us are delighted to be able to share some of this day with her. By being here, she is adding a special touch to what is already a special day – for the Scottish Borders, for Midlothian, and for Scotland as a whole,” she said. 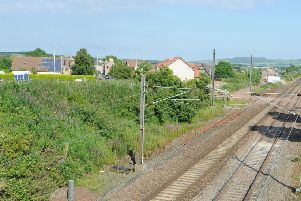 Ms Sturgeon said the new rail line was the result of £300m of investment and the expert work of more than 1,000 people. And she added: “More important than those figures, however, are the benefits the line will create. It will bring improved services for tourists – who can reach the beauty and history of the Borders in less than an hour. “It will reduce car use and help the environment. It will provide better connections for local businesses and residents. “And it puts the Scottish Borders and Midlothian back where they always belonged - on the railway map of Scotland and Britain. The Queen and First Minister received bouquets from Mollie Inglis, 4, of Tweedbank Primary and Erin Stoddart, 11, of Tweedbank. Erin said she enjoyed it but had been nervous: “The First Minister said it was a pleasure to meet me and the Queen said thank you to me.